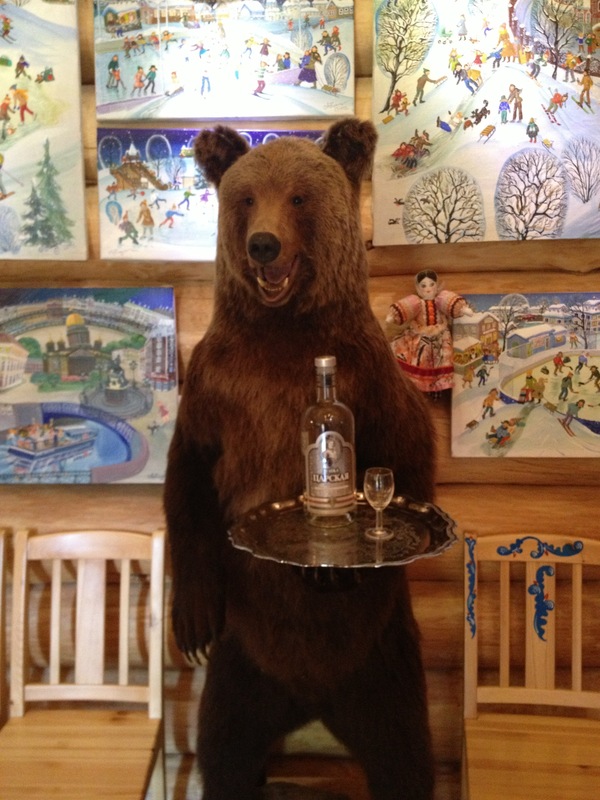 May I tempt you with a nice bottle of vodka with your pancakes? So to cap off this year’s travel season, the pièce de résistance (you have to say that with a bad French accent, and remember, roll your R’s! ), was a ten-day trip to Russia. For the uninitiated, and anyone that didn’t read the FAQ*, travel season is that part of the year where the temperature here at home is below freezing and there’s a minimum of a half foot of snow on the ground. So, pretty much September through May. Since we were going to be in the neighborhood anyhow, if one thinks of Russia and England as ‘in the neighborhood’, we decided to spend a quartet of days in jolly old London. Mary is a firm believer of getting in tune with the local time zone gradually. For instance, she feels it’s necessary to rest for a couple of days after arriving in LA before scheduling anything arduous, like walking, because it is after all a whole hour behind us. So four days in London would be great for acclimatization before moving on to Moscow. Plus there’s crumpets and scones. Why this is important escapes me, but it makes the wife happy and that’s what’s truly important. We tried a new route this time, flying to London from Chicago. Which necessitated a long layover as flights from Colorado Springs to O’hare aren’t exactly hourly occurrences. At least that was the ostensible reason for the layover. I think there might have been something to do with the fact that in Terminal 1 at O’Hare there is a new food stand, Tortas Frontera. Mary has wanted to try Frontera Grill, a restaurant in Chicago, for some time now. I think she may be in love with the chef, Rick Bayless, and would probably leave me for him in a minute, especially if he threw a plate of his chile rellenos into the bargain. I can’t really say I’d blame her, as my one and only attempt at chile rellenos was a sad, sad thing. When Mary learned that there was a Frontera Grill fast food stand at O’Hare airport, she started scheming on ways she might get to try it out. So, I want to be clear here, that there is no direct physical evidence that the whole trip to Russia was a fiendish and ingenious plan, the whole objective of which was a transfer in Chicago so she could try out Rick Bayless’ tortas. But, that may be because fiendish and ingenious plans usually have a phase where all the evidence is destroyed with thermite charges, and witnesses and henchmen are eliminated with extreme prejudice. Satiated with delicious guacamole and a torta with Mexican style short ribs, which I can’t even begin to describe, we boarded our Virgin Atlantic flight to destiny. And Russia, eventually. * Note: There is no FAQ. I just wanted to see if you were paying attention. FAQ’s take a lot of time and effort, and I have more important things to do. Real important things, like making a spreadsheet for my collection of beer bottles. I only have two bottles right now, and one of those was from last night, but it’s a collection, all right?